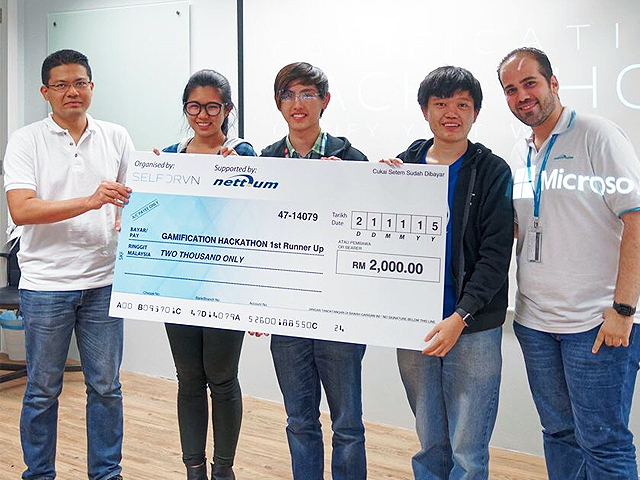 UTAR students from the Faculty of Information and Communication Technology successfully won the first runner-up in the Gamification Hackathon by SelfDrvn Enterprise held at Menara AIA Capsquare, Kuala Lumpur from 21 to 22 November 2015. The team Pentagon comprised Year Three students; Lau Kam Chuan from Bachelor of Information Systems Engineering, Lye Guang Xing from Bachelor of Computer Science, and See Ree Na from Bachelor of Communications and Networking. They walked away with a mock cheque of RM2,000, a Chrome Cast 2 from lucky draw and a certificate of participation each. Lau said, "The competition is about a fairly new concept of gamification, which is to engage users in exploring game-design elements and game principles in a non-game context. We have participated in three hackathons and we think it is the best platform to explore a new technology." He added working in team allowed them to have different fresh ideas and point of view in completing their task. Lau encouraged his juniors to take part in a similar competition to solidify their fundamental skills and develop interest in trying new things while studying. He also hoped to apply those skills not only in the competition, but also in actual cases in real life. Besides UTAR, the other participating universities are Asia Pacific University and Universiti Tenaga Nasional. Gamification Hackhathon is one of the initiatives by SelfDrvn Enterprise and supported by Nettium Sdn Bhd. 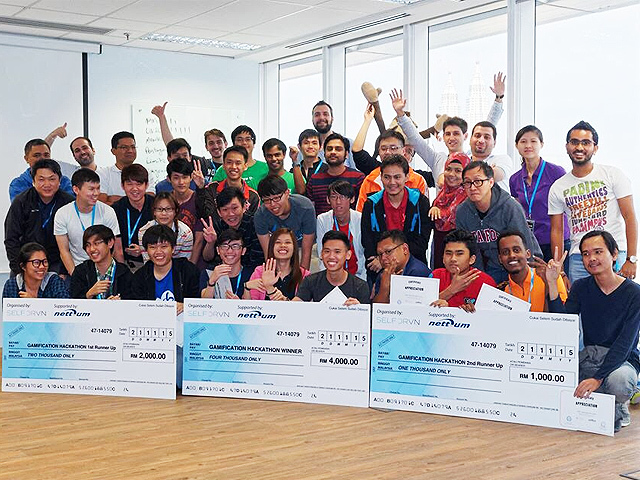 This hackathon let the participants creatively develop applications utilising the elements of gamifications in different aspects of work domains. The 30-hour competition will test the participants to develop innovative solutions using any mainstream programming language and operating system, based on the competition themed “Gamify Your Work Life”.